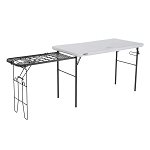 Made with high-density polyethylene plastic and a powder-coated steel frame. 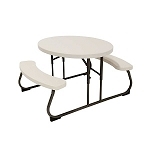 Round Picnic Tables at low prices and volume discounts. Shipping Discounts on 2 or more items. Large orders ship free at Competitive Edge Products. 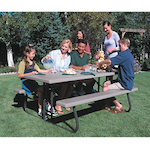 Lifetime has re-invented the picnic table! 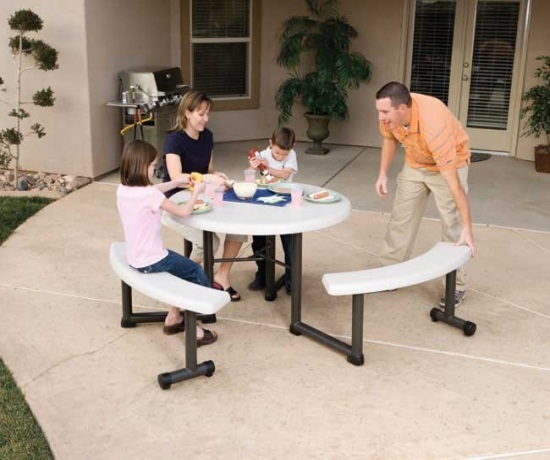 These plastic tables won't give you wooden splinters, rot, and mold like wooden ones. They come in round, rectangular, children's size, as well as convert into park benches. 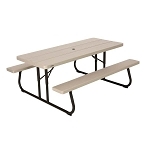 Some of the rectangular Lifetime picnic tables include faux (fake wood) slats to simulate the wooden look, but provide the lasting quality of plastic. the plastic SUV protectants to prevent fading and cracking. The metal is powder-coated with paint to avoid and prevent rusting for years. Assembly generally takes a few minutes if assembly is required at all. The instruction manual is done very well and includes an 800 number where customers can get assistance if needed. Shipping is fast with orders generally going out the next business day right to your home, business, school, and church. Give us a call with any questions and our US-based customer service department can assist you.